how to defend your home into the far distant future. First. Be reassured, you can do a proper job, safely. 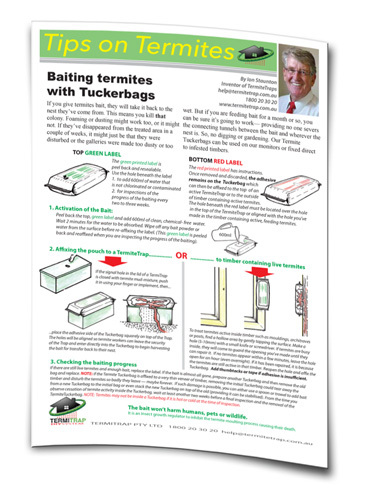 You’ll need bait to kill termites you’ve found; you’ll need monitors to intercept any new colonies snooping around your home and you’ll need advice. We offer you all three. Some plants developed woody stems to hold their leaves up higher in the competition for sunlight…. trees. 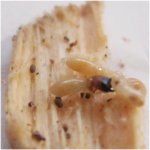 Some insects began to specialise in finding and eating this new stored energy…. termites. “They” say it was almost 400 million years ago that termites began to differentiate from cockroaches. 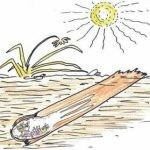 They nested in the soil’s protective, moist environment, but they adapted to harvesting the wood to bring back to feed the colony. And they’ve certainly worked out, there is more wood above than under the ground. So that’s where they begin scouting. Some termites specialised in damp, decaying wood, others specialised in solid wood, others concentrated on dried grass and leaf litter. 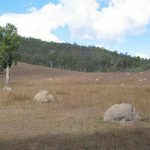 Different nesting sites and styles to suit the preferred food and climatic conditions evolved — mounds on the forest or grasslands floor, mounds up in tree branches, no mounds at all. Hundreds of genera, thousands of species, all specialising in their niche. In Australia there are about 300+ species but the main three genera do over 95% of the damage because these have concentrated on eating solid wood and their nests are usually below ground level or hidden inside trees. The only part of the mainland that is rated by the CSIRO as Low to Very Low is the narrow strip along the Great Ocean Road west of Melbourne. Which means the rest of us are in Moderate to High to Very High risk areas. 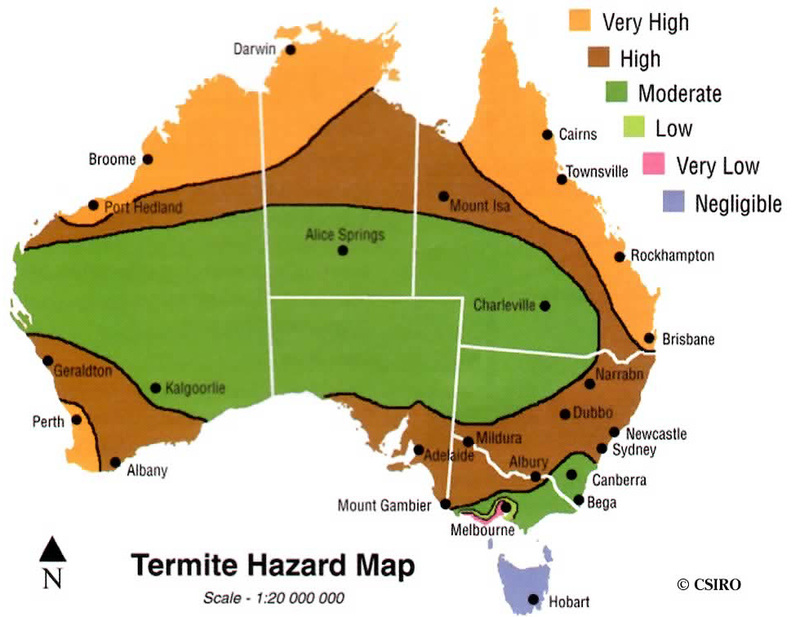 A few years ago, a CSIRO survey reported 32% of homes had had a termite presence. 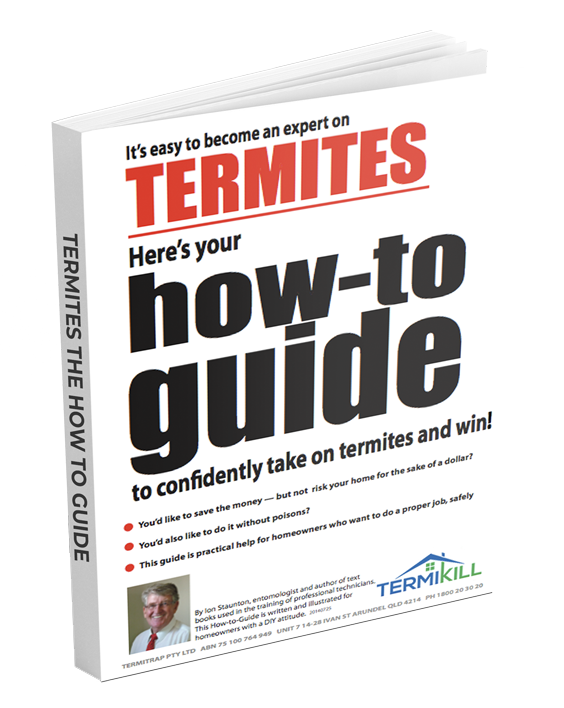 This was confirmed by the Institute of Australian Architects whose survey in essence said: of all the homes inspected prior to sale last y ear, one third had some termite damage. They forage for multiple food sources in many directions, never relying on one. They protect themselves with tunnels and seal their feeding areas from loss of humidity. When the upstart ants began developing about 100 million years after termites, the termites had to improve their security by building better protective tunnels. Ants and termites have been enemies ever since. Similar in size and choosing similar environments, it is easy to see why the First Fleeters at Sydney Cove were confused. They soon found the bottoms of their crates of stores eaten out by a mass of what they called “white ants”… actually termites. Same thing. 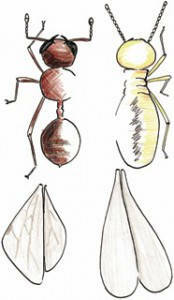 Ants have an elbow in their antennae; termites’ are like a string of beads. 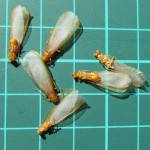 Termites are the only insect that has forewings and hindwings of the same shape and length. It’s a cycle, so let’s break in and start at the colonizing flight. 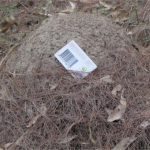 New colonies begin when winged reproductive termites fly out of a mature colony in the first weeks of summer when the heat and humidity outside are a close match to conditions inside the nest. They seldom fly more than 100-200 metres and of the thousands that leave home full of hope, most fail to establish a successful colony. The first problem is boy meeting girl, the next is finding something to eat which is in contact with damp soil before they themselves are eaten by birds, ants, spiders, echidnas, lizards, etc… or dry out and die. The young royals, having left the palace, do all the chores themselves until the first batch of workers complete their nymphal development. Then they can make babies they don’t have to look after. In their natural bush it’s relatively easy for them to find a fallen branch, leaf-litter or bark mulch, a stump or, if they are supremely lucky, a hollow tree. Around most homes there are tree and wood fragments mixed up in the soil and which gives the ‘honeymooners’ some homemaking options. Although probably 99% of couples fail to get past the first summer, some will become established. 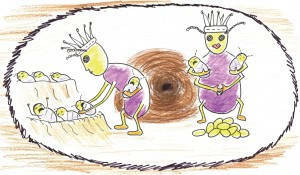 Once a nest site is chosen, the young couple, having shed their wings, begin to excavate and secure a chamber just below ground level adjacent to the wood/food. They tend their first eggs and the hatching nymphs which grow into workers in a series of moults, each a size larger than before. Initially, they are all worker caste but later some nymphs become soldiers. To be successful, the royals have to go deeper into the soil and have the new workers and soldiers take over nest construction and defense. More and more food sources must be found to feed the growing numbers of nymphs which stay in the nursery area until they go through a few moults to become adult workers and soldiers. Soldiers just defend. Workers scout for and find new food, chew it off, regurgitate it as food for soldiers, nymphs and the royals. They also move the eggs and organize the nymphs in the nursery and move them further out as they go through their moulting processes. Workers construct the network of tunnels, repair any breaches and get rid of bodies (like worn out workers after 3-4 years). T he queen may live for 10-30 years (who knows for sure?) becoming a bag of eggs. Once her egg production drops under say, a thousand a day, “they” sometimes select a developing reproductive to become the new queen. When the nest has been established about 3-5 years and every year from then on, a batch of nymphs will become reproductive “teenagers” developing longer bodies, heads with eyes and finally wings. Then on that warm, early summer evening, when the outside conditions closely match the warm and humid conditions inside the colony, someone yells “Geronimo!” and they flutter off into the dangerous unknown. The new cycle begins. Most termites require a constant source of moisture which is most reliably found in the soil. Those that build their nests in hollow trees have the best conditions: the hollow goes down to the moist soil and the encompassing tree trunk provides them with protection from predators, assists in humidity control and the heartwood is food. Termites from mounds that arise from the soil, or are attached to the outside of branches or trunks of hollow trees are also categorized as subterranean termites. 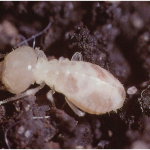 Subterranean termites are dependent on moisture. If they are separated from their humid and temperature controlled nests and galleries, they cannot survive. If a load of firewood or mulch is delivered with termites, they will die and definitely not attack your home. If a homeowner discovers termites in a window frame and rips it apart to see the extent of the damage, the termite workers will seal off the next narrow “pass’ back from that damaged area (closer to the nest) and those termites above or further out from the damaged area will dry out and die because they are excluded and can’t get back. 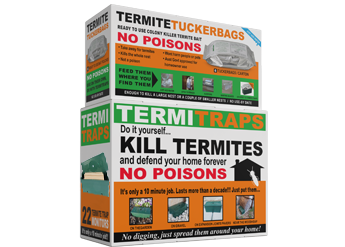 Termites of any species will not survive if separated from intact nest conditions. The alternative category is the drywood termites. These have a thicker outer shell to reduce moisture loss and have adapted to live in small colonies inside timber such as dead branches or perhaps furniture or framing timbers of high moisture content (say 15- 20%) which may be due to high relative humidity.